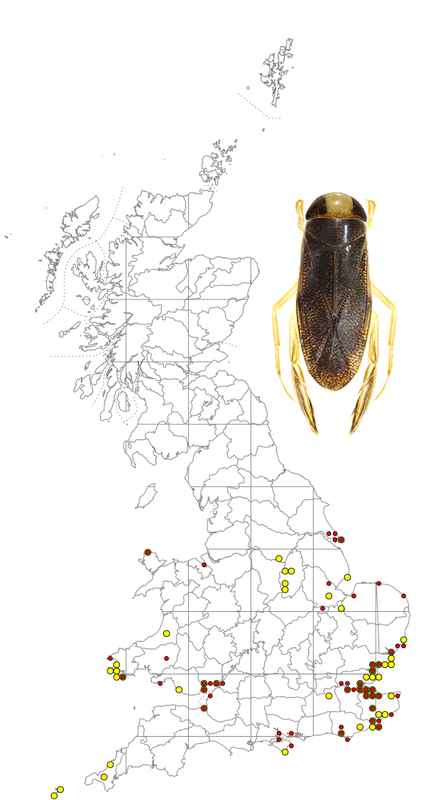 A species at the northern edge of its range in Britain, this waterbug is confined mainly to coastal sites in the south of the country. The map is based on records from NBN Gateway, with yellow dots showing pre 1990 records, reds dots 1990 – 2015 records and red on yellow dots overlapping records. There are a few recent records for Ireland in the extreme south and the Aran Islands. Corixa affinis is the smallest of the 4 species of Corixa found in the UK, with a length of 8.0 – 9.0 mm. 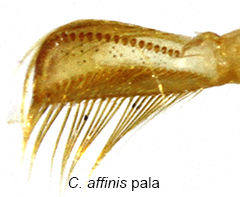 Like C. panzeri (10.0-11.0 mm) it has 10-14 pale lines on the pronotum (other Corixa species have 15-20), but can be distinguished from C. panzeri by size, the broader black lines on the forewings of C. panzeri and by the number of pegs on the male pala; C. affinis has fewer than 30 while C. panzeri has more the 30.